Wandering the crystalline kingdom that is Yosemite National Park in the deep winter, I came across historical sites, wildlife, and cozy spots to warm my toes and sip a toddy while watching the silent snowfall. Shallow snow crunched under my boots as I walked the path along the Merced River, a few hundred yards from Yosemite Valley Lodge. I was alone amid ice-glazed cottonwoods and tall, frosted grasses reflected in the dark mirror of the river. Although a rushing torrent filled with snowmelt in the spring, in mid-winter, the river barely sighs as it moves between softly mounded snow banks. While exploring Yosemite in winter, the only sounds were my steps and the occasional plate of ice tweaking off the riverbank and floating away. Rounding a bend into a frozen meadow, I gulped and my eyes filled with tears, as they always do, at the sight of El Capitan—the Snow King—the immense wall of silver-gray granite looming like a skyscraper into the dazzling-blue sky. Topping out at 3,500 feet, four times as large as the Rock of Gibraltar, El Cap is said to be the largest single block of exposed granite in the world. An unforgettable sight glistening in the winter sun, El Cap is a relic of an Ice Age, two or three million years ago, when glaciers ripped through this valley leaving the famous monoliths, domes and peaks—Half Dome, Cathedral Spires, Royal Arches and many more—that we see today. Fumbling with my camera, I looked up to see a coyote standing on the stone bridge, about fifty feet away. We locked eyes, I held my breath. He was warm in his thick, pale-golden fur coat, and supremely confident, while I shivered in my (fake) fur-collared parka. With a twitch of his ears, he tiptoed away like a ghost into a snowy meadow. Coyotes, mule deer, raccoons, the occasional black bear and other wildlife are easily sighted at this time of year when the deciduous trees and shrubs are bare and few people are driving, biking and walking around. At 4,000 feet in elevation, the valley receives less than thirty inches of snow through the season––just enough to lightly decorate the landscape. This is my favorite time of year to be here, for when the snow flies, the number of visitors drops dramatically and I feel as though I have the place to myself. The average daytime temperature is in the low 50s and skies are often sparkling and sunny, perfect for walks, and when the snow sticks, for snowshoeing. Many visitors stay warm by hopping on and off the free shuttle buses that cruise the valley floor. When storms clear and mists wreathe the peaks and spires, it’s an exciting time to tour and photograph the valley. Starting from the Ansel Adams Gallery in Yosemite Village are free, two-hour guided photography walks that showcase the snow-dressed pines and icy waterfalls, lacy aspens, and the magical reflections in the Merced River. After a few days of dry weather, the first half-mile or so of the lower Yosemite Falls trail makes for a great winter hike. An easy paved and boardwalk trail also meanders through a woodland at the base of the falls. The most visited site in the park, the entire viewing area at the base of Yosemite Falls has been transformed in recent years, with habitat restored, and new footpaths and handicapped-accessible nature trails laid out. Massive wooden benches, stone walls and boulder alcoves create a tranquil resting place from which to enjoy the thrilling rush of the tallest waterfall in North America. In the wintertime, the double avalanche of water dropping 2,425 feet is much diminished, while still magnificent. Ice cones as large as 300 feet high form on the ledge between the two cataracts, and when the sun warms at midday, the ice often cracks, thundering across the valley as it bursts. With icicle-clad Half Dome looking on from above, ice-skating is fun to try or to watch at the outdoor skating rink in Half Dome Village (formerly Curry Village). Sidle into the warming hut, hang out at the fire pit, have a hot drink and a snack, or rent skates and waltz around the ice! Winter is the coziest time of year in the park. 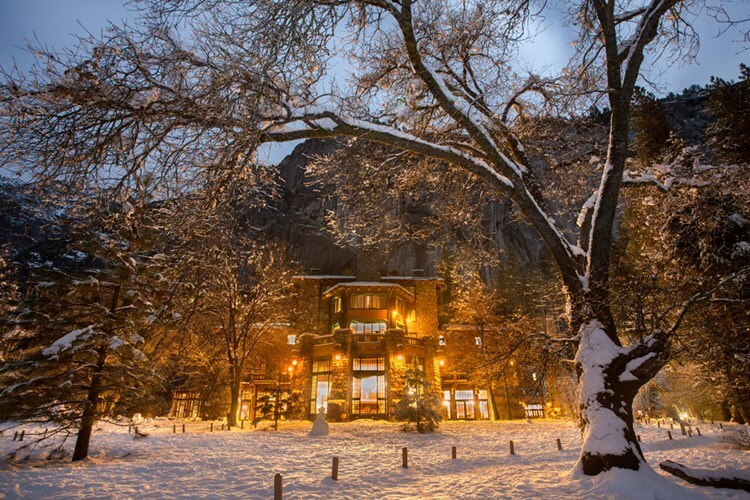 My husband, Michael, and I love to sip hot buttered rums while toasting our toes at the round fireplace in the Mountain Room Lounge at Yosemite Valley Lodge, with Yosemite Falls a whisper of its summer self visible beyond the tall windows. Kids crowd around the wonderful Swedish-style fireplace, here, to roast marshmallows and make s’mores. In Half Dome Village, an encampment of wooden cabins and tent cabins open weekends and holidays in the winter, campers gather in rocking chairs by the fireplace in the nostalgic old lounge building, where vintage photos and artifacts call for a stroll around the room. Under the incense cedars, Kellogg oaks and Jeffrey pines in the eastern end of the valley at the foot of Glacier Point, the original Curry Village was established in 1899, and is the camp that many people remember from their childhoods. The oldest ski resort in the state, Yosemite Ski & Snowboard Area (formerly Badger Pass) opened in 1935 and is still one of the best ski mountains in the country for adult beginners and intermediates, and especially for kids learning to ski. Six lifts take skiers to the 8,000-foot summit, which receives about 180 inches of snowfall annually, for downhill skiing and snowboarding. Winter fun also includes snowshoeing, Nordic skiing and sliding on the tubing hills. Within the park are 350 miles of cross-country ski trails and roads, with over 90 miles of marked trails and 25K of machine-groomed and skating lanes. You can also take a guided or self-guided for an overnight at the ski hut, including meals. This lodge is the closest to the Yosemite Ski & Snowboard Area, and you can bring your own x-c skis to explore around the area, which is mostly flat, through the forest. Check in advance when making reservations at Big Trees Lodge, as it’s often open only on weekends in the wintertime. 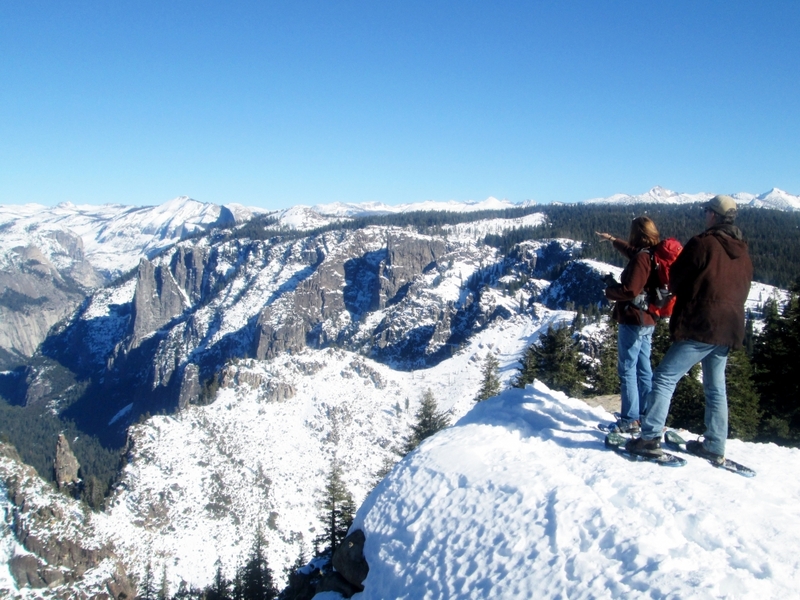 Come to Yosemite in the Wintertime! Yosemite National Park is open all year round; the lowest elevation, driest highway into the park is Highway 140 from Merced to the Arch Rock entrance. Always check in advance to be sure that roads and highways are open, even in the summer. 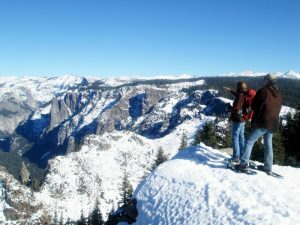 Fewer visitors arrive to experience wondrous winter world of Yosemite, making it all the more enchanting for those of us who do. Whether dozing by a blazing log fire, walking in a forest sprinkled with snowflakes, or meeting up with a furry coyote, the magic of Yosemite will warm your heart. Springtime in Yosemite National Park: Wildflowers and Waterfalls! Winters by the fireside at Lake Tahoe! Winter in Yosemite is my FAVE. 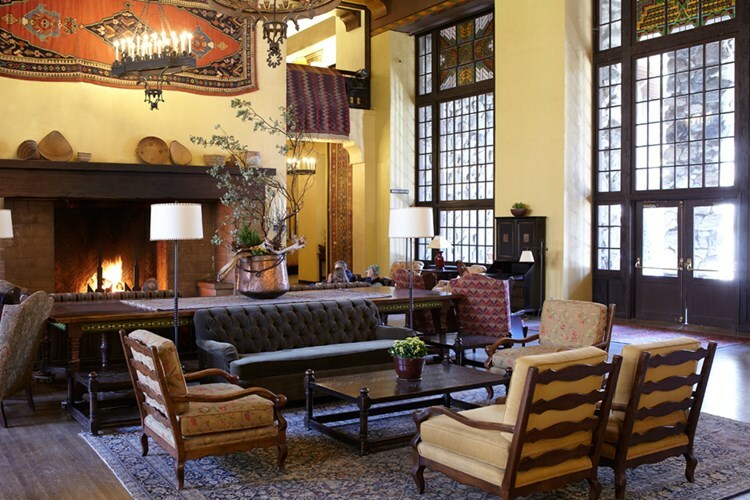 Love the quietness, the solitude, the fewer people, the comfort food and ambiance of the Great Room at the Ahwahnee. There is nothing like it.